For one of our customer, we have implemented an integration solution for their on-premise CRM and ERP application using BizTalk Server 2016. Now it’s ready to go LIVE and we are helping them to build PROD environment. But in next 6 months or so they would move their current database server farm to a new one. So, we suggested them to create a SQL server alias as it will not require to re-configure BizTalk server once the database server is changed. While configuring BizTalk server we started getting error – SSO service failed to start. First we try to connect the database server from BizTalk server using SQL server Management studio for the SSO admin user and it connected successfully. 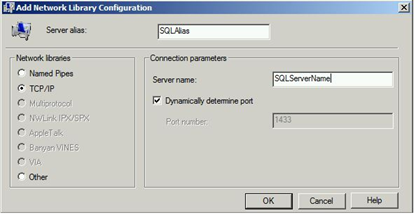 Next we started looking into the SQL server alias configurations. 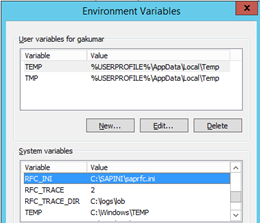 You can create aliases using SQL Server Client Network Utility. These aliases need to be implemented on each BizTalk Servers in the group. But the alias was only configured using the 64bit cliconfig.exe and not with 32bit. Once we configured the alisa using 32bit cliconfig.exe, we got rid of the error and BizTalk configured successfully. So basically the SQL server alias must be configured using both cliconfig.exe, 32bit and 64bit otherwise you might get the error – SSO service failed to start. In last couple of months quite often we were been reported by one of our EDI trading partner that they have not received the 997 acknowledgement message for the 850 PO message they sent us. They did not even receive MDN. When we check the particular PO in our logging system, BizTalk admin console and SAP ERP we didn’t find it and hence we ask them to resend that particular PO. When they re-sent the same PO it got processed successfully and they received the 997 also. But the frequency of this incident started increasing which forced us to dig deeper to get the root cause of the issue. The issue was caused only for the files which have multiple interchanges with different delimiters “ | ” and “ * ”. When they resent the PO it had only one delimiter “ * ” . There is a custom pipeline component EDICleaner in the solution which is used in the AS2 receive pipeline. This custom component is in place to remove any garbage characters before the start of the EDI interchange. But the logic included only for the delimiter “ * ” and hence the PO with delimiter ” | ” was getting stripped off. It was really interesting one to crack. Here is how my team mate, Arindam nailed down the issue using the BAM tables for AS2/MDN. So basically we asked out trading partner to provide the 850 PO file name which they had sent us. And when we queried the BAM table with the file name we got the record. Using the time stamp from the above record, we queried the completed instances in tracking database and we got that the message have been received by the pipelines. After debugging the same message in development environment we found the issue which was in the custom pipeline component. 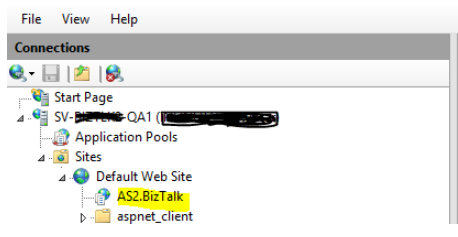 Configuring BizTalk for AS2 communications can be challenging and time-consuming at times. The most complex aspect of it is dealing with certificates. 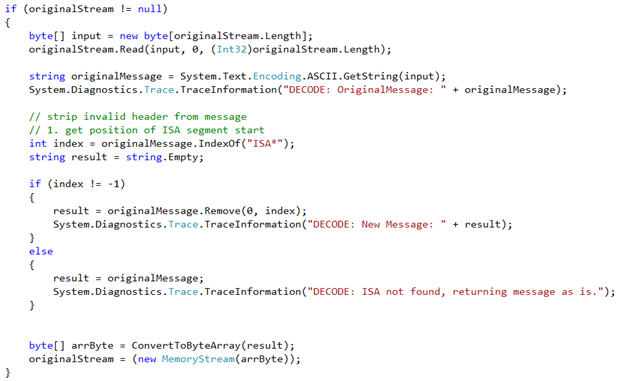 In the last post I discussed about Secure messaging and Configuring certificates for AS2. 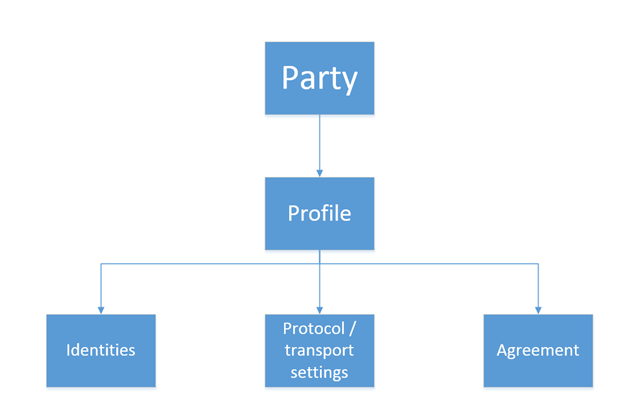 In this post I will discuss about the Agreement and Party settings to handle EDI data over AS2. EDI relies heavily on the concept of Party. Party really is a representation of a particular group within organization or partner you do business with. EDI/AS2 settings are defined in party profiles and agreements define relationship between two parties. Trading partner agreements is an understanding between two business profiles to use a specific message encoding protocol or a specific transport protocol while exchanging EDI messages with each other. 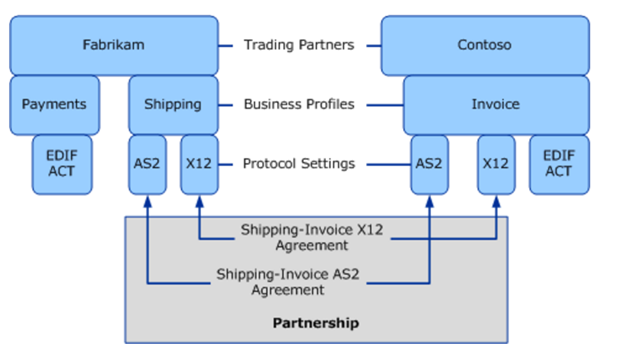 In the above illustration, there’s an agreement between the “Shipping” and “Invoice” profiles of Fabrikam and Contoso respectively to use the X12 encoding for business messages (encoding agreement) and AS2 transport for exchanging messages (transport agreement). There can be many such agreements between various business profiles. For example, there can be an agreement between the “Payments” and “Invoice” profiles to use the EDIFACT message encoding standard. All such agreements for all the profiles for a pair of trading partners constitute a Partnership between the two trading partners. 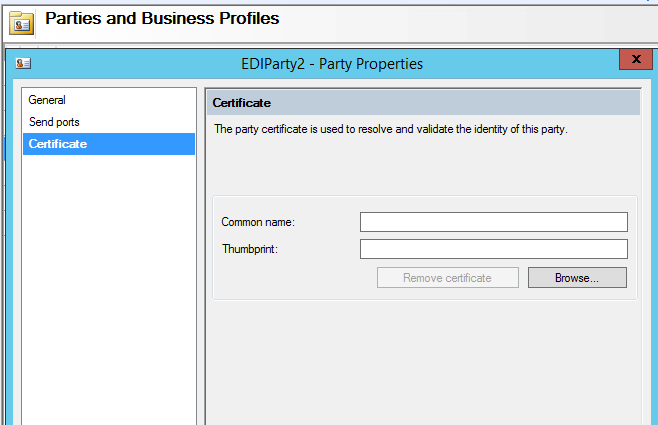 In order to specify how to handle the EDI data is being sent via AS2, you will need to set up a BizTalk party and two agreements. 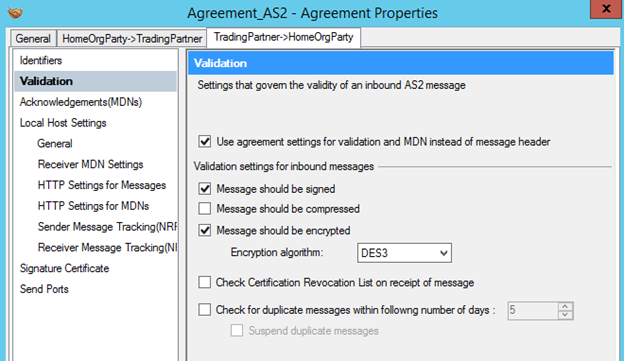 One agreement is for the AS2 messaging (transport agreement), and one agreement is for dealing with the actual EDI data (encoding agreement). 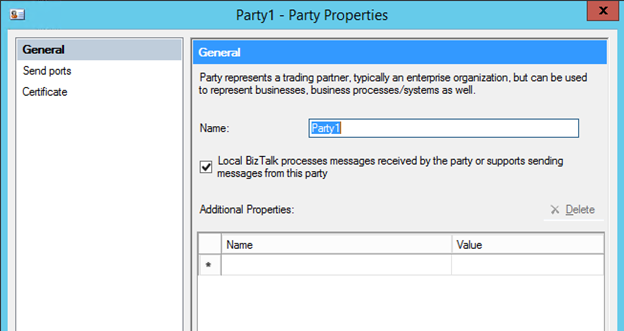 – Create a new BizTalk party with the name of the trading partner from which you will be receiving data. – If you will be sending a 997 to the trading partner, specify the send port that the 997 will be sent out on. On the General tab, set the Protocol property to AS2, the First Party to your home organization, and the Second Party to the trading partner. Once you’ve set the General tab this way, two additional tabs will appear: one for inbound data from the trading partner, and one for outbound data to the trading partner. If you are just receiving data from the trading partner and returning an MDN, you only need to configure the inbound trading partner tab. 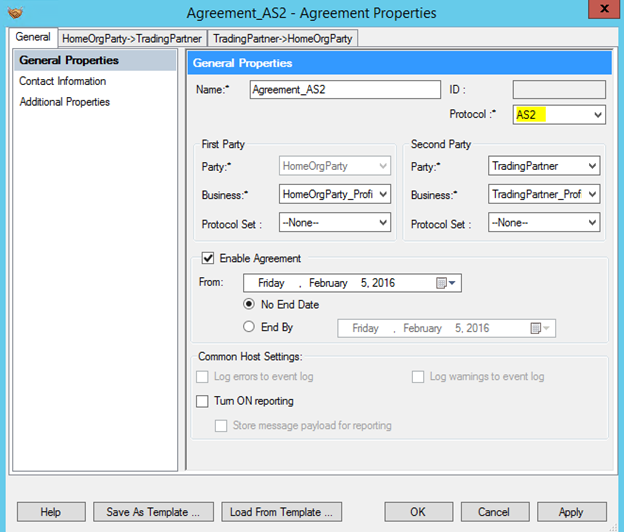 – On the inbound trading partner tab, on the Identifiers tab, set the AS2-From and AS2-To properties to the appropriate values as defined in your trading partner agreement. – On the Validation tab for the AS2 agreement, you can set the appropriate values for validation of the data. For example, if you are receiving a signed and encrypted inbound post from a trading partner, then you would set the properties. The MDN is the acknowledgement for AS2 posts. 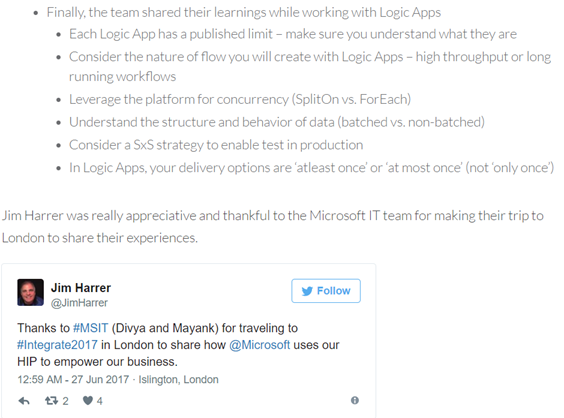 There are two possible methods for postback of an MDN: synchronous and asynchronous. The synchronous response is posted back via the same open HTTP connection that the original document came in on, and does not require any additional BizTalk Components. Simply set the Request MDN checkbox in the BizTalk agreement, and it will automatically post back. For asynchronous MDNs, a send port must be created.There are some additional properties that will likely need to be set or adjusted on the other tabs; a few of the most common are noted here. 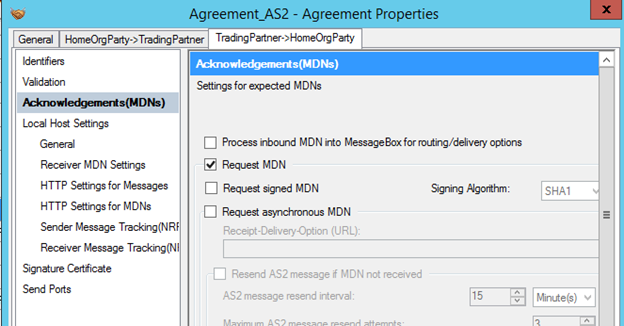 On the Receiver MDN Settings tab, enable the Sign Requested MDN setting if you want to always send an MDN, regardless of what is noted on the inbound AS2 request from the trading partner. In the HTTP Settings for Messages, enable everything except for the Ignore SSL Certificate Name Mismatch property. In the HTTP Settings for MDN, enable everything except for the Unfold HTTP Headers property. On the Signature Certificate tab, set the certificate that you want to use for signing the outbound MDN. 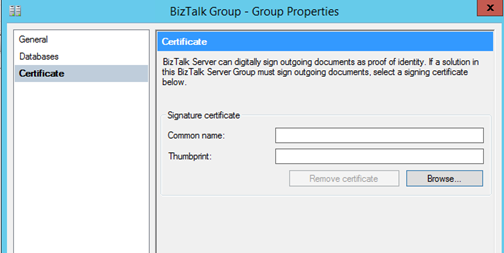 If nothing is selected here, the default certificate for the BizTalk group will be used. 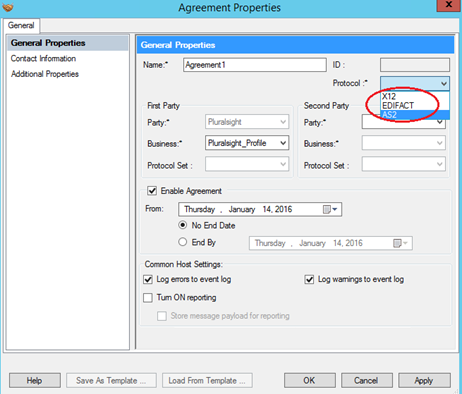 Create a new agreement for the EDI data that will be consumed. Setting this up will depend on the specifics of the EDI document type(s) that are being received over AS2. What is important to know here is that you must have this additional agreement in place so that BizTalk knows how to process the EDI data once the AS2 agreement has successfully completed the data transfer. 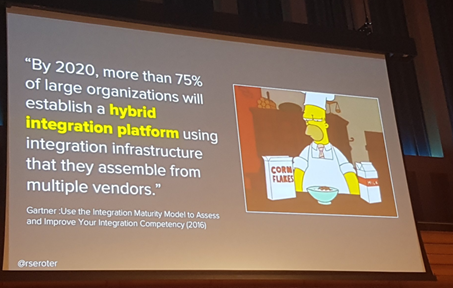 As mentioned by Mark Beckner in his EDI book, that one of the most challenging (and frustrating) aspects of AS2 configuration is the actual trading partner testing. The best advice is to plan to set up your AS2 configuration in stages. Try to exchange plain text data (unencrypted and unsigned) first before dealing with the various settings requiring certificates. If you can get the plain, unencoded data to flow (and the MDN to return) successfully, then you can move into testing encryption and signing. There are many things that can go wrong during testing, and the error messages are often very generic and cryptic. The errors could be on your side, or they could be on the trading partner’s side. The more you can do to limit what is being tested at any given stage, the quicker you will be able to get to resolution and completion. AS2 is one of the most popular methods for transporting data, especially EDI data, securely and reliably over the Internet. Messages may request a Message Disposition Notification (MDN) back if all went well. Upon the receipt of the message and its successful decryption a “success” MDN will be sent back to the original sender. Trading partner agreements play a key role in AS2 support in BizTalk Server. Most configuration and administrative functions related to AS2 processing in BizTalk Server are performed by configuring the trading partner agreements between business profiles. You can specify the AS2 properties as part of the “transport protocol settings” for a business profile or by directly specifying the AS2 settings in the trading partner agreement. Secure messaging of EDI data is achieved using public and private keys. Organization (Trading Partner) generates keys; distributes the public and keeps the private secret. Data encrypted by public key can only be decrypted by private key. B gives public key to A and keeps the private key secret. Digital certificates are just electronic documents that contains public key. These certificates are signed by a trusted Certificate Authority (CA) and the signature binds owner’s identity to the public key. How can A tell that it’s being modified by some other entity / system? How does A verify CA’s signature? Windows has several different certificate stores. Using certmgr.msc allows a certificate to be installed for the current user. However, to make a certificate available to services and other process that run under the Local System or Local Service accounts, you must import the certificate into the Local Computer store. Under Available snap-ins, select Certificates and press Add>. Select Computer Account for the certificates to manage. Press Next. Select Local Computer and press Finish. 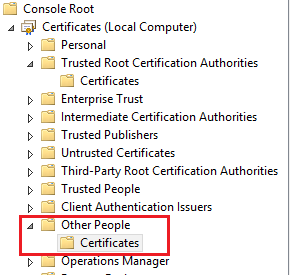 Continue and select: Trusted Root Certification Authorities -> Certificates. Also install the Trading Partner Public Certificate in Other People. Right-click Other People, point to All Tasks, and then click Import. 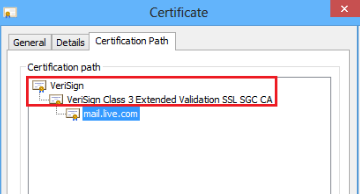 Generate the Private certificate on the server. Alternatively, a certificate can be purchased from VeriSign, DigiCert or other providers so that the CA Root Authority is more standard and available when dealing with outside Trading Partners. Especially when Servers are not exposed to the Internet. Generate a Public key and send this off to the External Trading Partners. In the BizTalk Administration Console, right-click the BizTalk Group and select properties. Click the Certificate option and select Browse. Select the Private certificate for your home organization. This will be your primary certificate used to sign outbound data. Note: In some scenarios, for specific parties this default private certificate can be overridden. 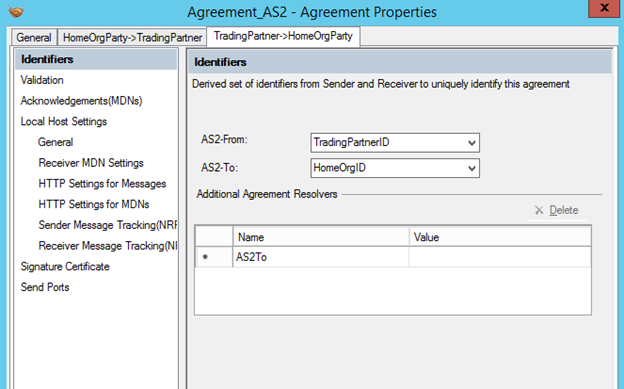 This can be done in Certificate page of the AS2 properties for your trading partner. You also need to check the Schannel SSP registry entries for TLS/SSL Settings. You might face SSL/TLS handshake failures while sending message to the trading partner. Please refer the excellent post by Riaan for troubleshooting SSL/TLS handshake failures. Configure an HTTP Receive Handler and IIS for an HTTP Receive Location to receive the EDI message from trading partners. SAP .NET Connector 3.0 is the current version of SAP’s development environment for communication between the Microsoft .NET platform and SAP systems. SAP has already announced deprecation of its classic RFC SDK and they will stop supporting it after March 2016. 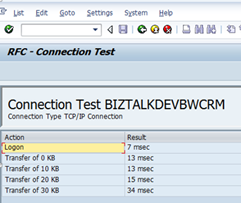 So BizTalk server product group has added support for the SAP .NET Connector in WCF–SAP adapter. And they have released it with cumulative update 2 for BizTalk 2013 R2. 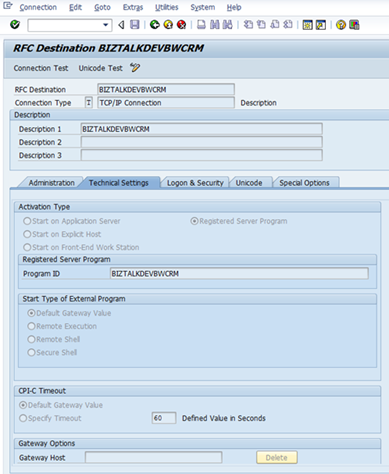 Currently the BizTalk WCF-SAP adapter will support both the RFC SDK and the SAP .NET Connector (NCo) through the ConnectorType property within the WCF-SAP binding. Connector type value can be ‘ClassicRfc’ and ‘NCo’ as explained in the whitepaper released on the Codit website. SAP .NET Connector from the SAP Service Marketplace – http://service.sap.com/connectors. Architecture wise it is the re-engineering of Microsoft BizTalk Adapter for mySAP Business Suite to replace Classic RFC SDK from new NetWeaver RFC Library. 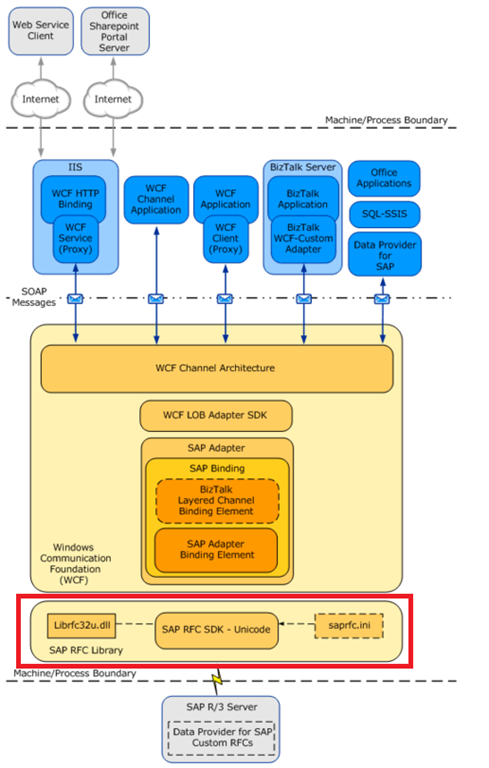 So in conclusion Microsoft has provided the cumulative update / hotfix for WCF –SAP adapter which can be used to make the transition to the new SAP Connector for .NET as smooth as possible. 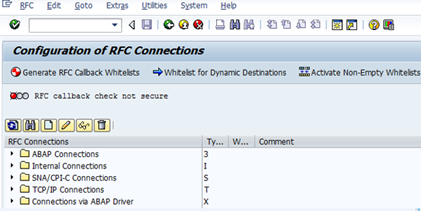 Both the WCF-SAP and WCF-Custom adapters are updated with a new property that allows you to choose between the Classic RFC and the new Connector for .NET libraries. 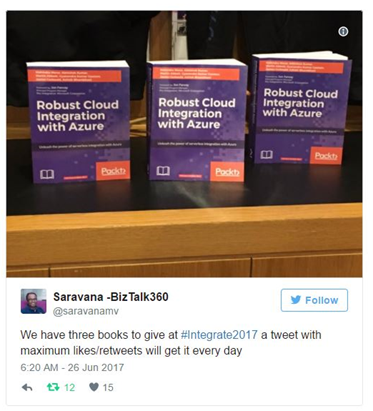 Please refer the whitepaper for further details. 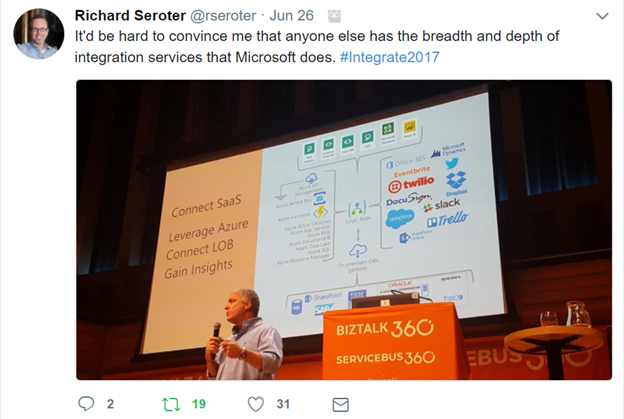 In the previous two post I discussed about the overview of SAP , how do we generate schema and configure ports in BizTalk to consume the IDOC. 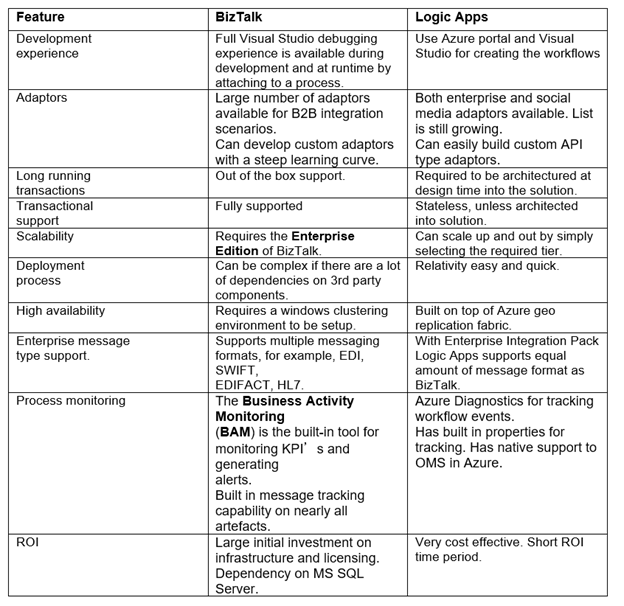 In this post I will discuss about the RFCs / BAPIs overview and setting need to be done on BizTalk server to consume them. RFC stands for Remote Function call and is the standard SAP interface when exchanging data across SAP systems or between non-SAP systems and SAP systems. RFC is a SAP protocol to handle communications, and is used to call functions in an SAP system by a caller external to SAP or to call programs external to SAP from an SAP system. It is the process of calling a function module which is residing in a different machine from the caller program. RFCs can be used to call a different program in the same machine as well, but usually it is used when ‘calling‘ and ‘called‘ function modules/ programs are running on separate machines. 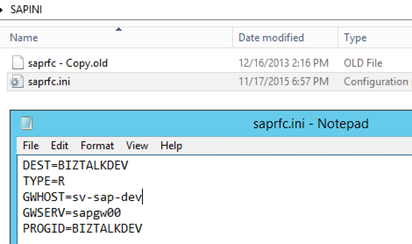 Functions can only be called via RFC, if they are tagged as RFC functions in the SAP development workbench. BAPI stands for Business Application Programming Interfaces and are basically a RFC-enabled function module. It is a library of functions that are released to the public as an interface into an existing SAP system from an external system. So a BAPI function is a function module that can be called remotely using the RFC technology. A function module is a logical grouping of domain specific functions that belong together. For instance, we may have a Human Resources (HR) function module that will contain all available HR operations. BAPIs, RFCs and IDOCs are often confused. A question comes up regularly is when to use what? BAPI is a business object. An RFC is functional code. IDOCs OR intermediate documents are standard data structures for electronic data interchange (EDI) between application programs. 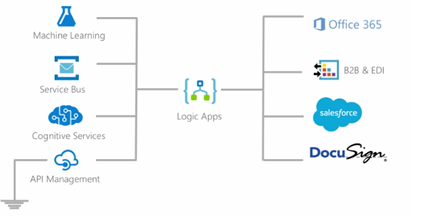 IDOCs are used for asynchronous transactions: each IDOC generated exists as a self-contained text file that can then be transmitted to the requesting workstation without connecting to the central database. Synchronous scenarios are better suited to leveraging RFCs/BAPIs due to their immediate request/response mechanisms. For example, take the situation where SAP is the system of record for customers within your organization, but you have chosen to use Dynamics CRM for a specific application. We do not want to manually key in customer information in both systems if we don’t have to. So we can build an interface that will query SAP to retrieve the master data for an existing customer in our organization. In this situation, we would not want to use an IDOC, if we are expecting an immediate response, as BizTalk would send the IDOC in and then have to wait for a response from SAP asynchronously. When SAP does send the response back to BizTalk, we may have to correlate this response with the request that was sent into SAP so that BizTalk can provide a correct response to the calling application. The first thing is to create a System Variable called RFC_INI. We then need to provide a path and a filename. For example I have used C:\SAPINI\saprfc.ini. 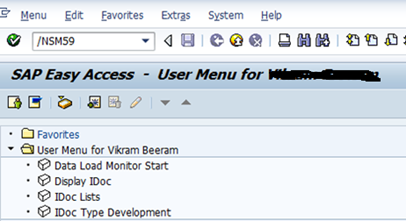 Now that we have our SAPRFC.ini file and if you have also created SAP Receive location then we can run a connected client test using SM59. Launch the SM59 transaction and then expand the TCP/IP Connections node. 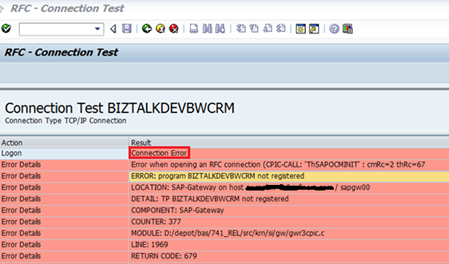 Connection test will fail if something is wrong in SAPRFC.ini file or receive location for receiving the IDOCs is not running. 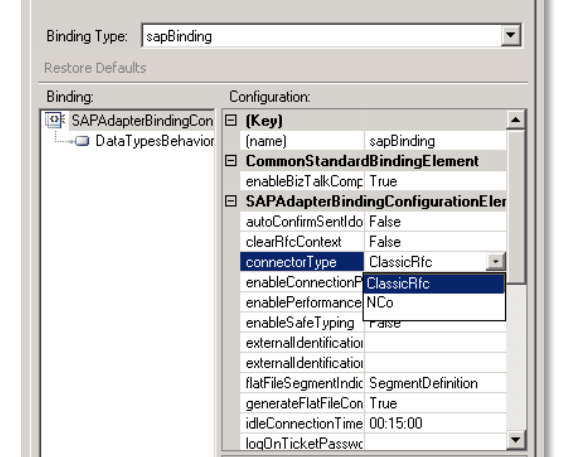 Once you have a proper SAPRFC.ini file and receive location for receiving the IDOCs is running, the test connection should pass. With connectivity issues out of the way, you can browse for your desired schemas using the BizTalk Consume Adapter Service Wizard and then add them to our BizTalk solution. Please refer the part1 and part2 for schema generation and port configuration in BizTalk.